So, I'm doing this one on Friday. Silent on the Moor is the third book by Deanna Raybourn about Lady Julia Grey and the half-gypsy detective Brisbane. She goes to Yorkshire to stay at Brisbane's house and "have it out" with him about their relationship--and winds up dropping into the midst of a bizarre family situation. Between the mummified infants she finds in the walls and the near-poisoning of one of the residents, Lady Julia has quite an adventure. The problem for me was that she mostly had it alone. While Brisbane is the love of her life, they spent far too much time apart for my preference, and what time they did spend together, she was usually spitting mad at him. Which made the happy ending a bit abrupt and awkward-feeling to me. I didn't get quite why she was so keen on him. But I still liked it. So... That's the book report. 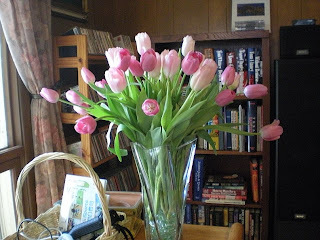 Several years ago--so long I don't remember where it was, much less when--Jennifer Crusie spoke to RWA's national conference as keynote, or one of the big speakers, she said "We need more storytellers and fewer writers." The whole ballroom full of published and aspiring writers burst into applause. Genre writers understand that it's about the story. Yes, language and craft is important, but without a story to tell, you might as well be writing poetry. Not that there's anything wrong with poetry. I like poetry just fine, but I have to admit that my favorite place to find poetry is in song lyrics. I don't read a lot of it, and I don't write it, because--well, I'm all about the story. A novel is a story--or it had better be. Otherwise, nobody much is going to want to read it. All the art must be in service to that--to the telling of the story. You can be just as pretty or writerly as you want, but if the pretty words don't serve the story, you have to chuck them out. 1. Do Not BORE Your Reader. 2. Do Not CONFUSE Your Reader. An interesting Plot with interesting Characters takes care of Rule #1 (for the most part). Decent grammar and clarity of language helps with Rule #2. And sometimes, pretty words get in the way of Rule #2. Every other rule out there that people tell you about--feel free to break them, once you know how and why they work. These two? If you break 'em, you won't sell your book, because your first readers--your prospective agent or editor--will get bored and/or confused and they won't buy or help you sell your book. Art is great. I got nothin' against art in any shape, form or fashion. (I know, resorting to cliches. Deal with it. It's a blog.) But in fiction, storytelling comes first. Art must serve the function--which is story. Ha! finally got the pictures downloaded off the camera. (The fella STILL hasn't downloaded the San Francisco pics onto his computer, and that was back in October! Grr.) So, y'all are getting the whole shebang. 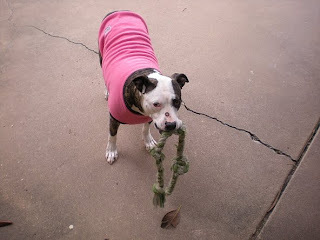 First, here is the princess wussy granddog with her tug-o-war rope. That spot on her nose is the bobo she got when she scraped a nickel-sized hunk of skin off her nose on the fence while jumping at a possum. It's almost well now, but it made an icky scab. 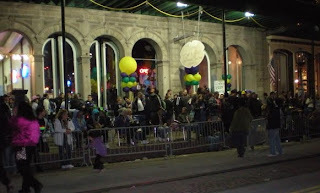 I have posted about Mardi Gras, and here are some of our Mardi Gras pictures. This first one is of The Strand--Galveston's main downtown street--just before the Knights of Momus parade on the second Saturday of Mardi Gras. The fella took all the pictures of the Aquarius parade on the first Saturday, and I don't know any of the people in it, so I'm skipping to these pictures. The son's girlfriend came down for the weekend, which was Valentine's as well as Mardi Gras, so for the big parade, we went downtown, had dinner at Bistro LeCroy (on The Strand) and then watched the parade on 21st Street. 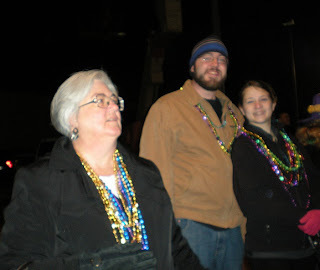 This is us--me, the boy and the girl (kinda blurry--the fella took it)--on the street waiting for beads. I think we're just between floats. I did catch a respectable number of beads at this parade, including some fancy gold ones with crowns. There was a guy who wanted to trade me for some of those crown beads. He offered me a string of plain beads plus a drink of his vodka. Um--no thanks. I'll pass. 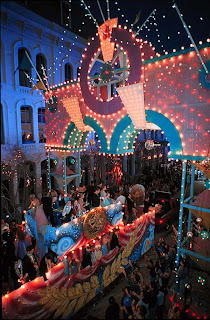 The parade theme was "Treasures of the Sea." 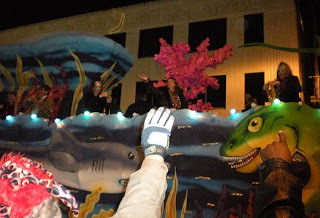 Hence the shark float here. You can maybe see the beads in mid-air. Some of those people could really throw those suckers. Okay, so then on Sunday, we went to the midafternoon parade of the Krewe of Barkus & Meoux--the pet parade, sponsored by the local Humane Society. Any pet could march, but aside from a few ferrets in a cage in a wagon, most were dogs. And Oh the Costumes! 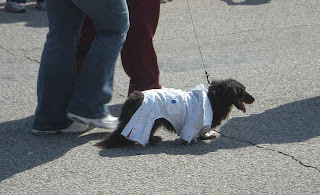 Here, you see the Elvis Dog. There were greyhounds in Mickey & Minnie costumes, a standard poodle dyed green and purple, and dogs in just bandannas. Lots and lots of greyhounds. We met up with a friend of mine who went to Baylor too, several years after I graduated. She was a writer friend while she was in Baylor, and now, we both live in Galveston (though she's now way out on the West End). 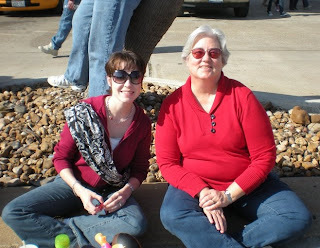 There was a children's parade after the dog parade, and we got tired and sat down to wait for it to arrive. She brought her toddler, who is massively cute, and warmed up to me enough to give me a hug, which totally warmed this Gigi's heart. The Toddler also danced. No music, she just danced. 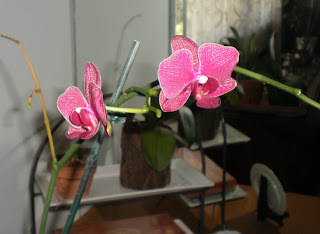 The little clay pot in the background is the baby orchid I cut off from its Mama, finally. It seems to be doing well. Growing a new leaf and everything. The lovely Carol Burnside presented me with this award on Monday because-- well, maybe because I was somebody she knew with a blog who hadn't received it yet. I'm not sure what it's an award for. Oh, I know! The conditions that come with this award are that I must tell you seven things about myself that you may not know, and I must send it on to seven more people. So, without further ado, here are my seven things. 1. 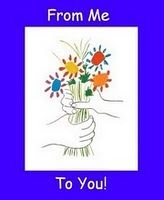 I am an oldest child, and despite my disorganized nature, have a tendency to want to organize others. 2. I have two-toned eyes. Really. Yellow in the middle, and blue around the edges. 3. I am BONE lazy. Alas. My ideal day would be sitting around, reading books all blessed day long. 4. I wrote my thesis for my master's degree in history on Baptist missions in China from 1911 to 1945. Really. 5. I sing alto. I really prefer singing the harmony, and not just because I can't hit those high notes. Now, who shall I present with this lovely award??? I am presenting it to you because you are ALL Great People!! 1. C.E. Murphy (of Urban Shaman fame) at the essential kit. 7. Anne Marie Novark who is hugely supportive to writers at Just Write! So. There it is. My award. And my awardees. No, Mardi Gras did not cause my mania. That came from an entirely different source. But Mardi Gras was a whole lot of fun. One of his friends had set up a flatbed trailer in front of the grocery store, with a grill, and he and his family were grilling all sorts of things. Chicken, venison-cheese-jalapeno sausage (Yum! ), brisket, ribs, boudin--you name it, they were cooking that stuff on that grill. Ate a sausage and a chicken leg, hollered for beads during the Aquarius krewe parade, got sunburned, then walked back to the house. At 6, some more of the son's friends showed up--for the parking. Our house is closer to the seawall parades than a lot of people have to park. So we all walked back up to the grill trailer to watch the Gambrinus parade. Including Dolly the granddog. She was very good for the parade. The Budweiser Clydesdales fascinated her. The drums in the bands scared her, the first few of them. She ate lots of rib bones and snackies, (I had another half-sausage & a Mojito cooler) and she met a dog that looked almost exactly like her. The other dog had the same shade of brindle coat, same white face, same patch over the left eye--the main differences were that the other dog is 11 years old, and Dolly is 3, Dolly is a little bigger and heftier, and she has a white tip on her tail. I scored some good beads. The fella threw me a string with harlequin jester heads, and never saw me waving at him. But he got me good beads anyway. :) And I got a strand of beads with beer mugs on them that night. Then the next day I was packing up to travel to check on the Alzheimery parents, and got a phone call from my mom that my dad was in the hospital. So I hurried up to get here--He's home again now. He caught a stomach bug that he needed an IV to recover from. It's been pretty hectic. Haven't been able to write, for taking care of folks. But things just worked out okay. Now to get all their tax stuff together...still missing a couple of 1099s. Sigh. Okay, maybe not you, and definitely not me--but it is possible. 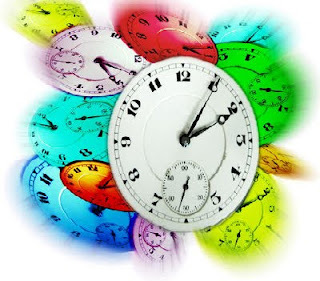 There are those who are able to write in 10-minute increments. Then there are the people like me. It takes me a while to get into the story. I need to re-read what I wrote yesterday, so I can remember where I was and what the dominant mood was for this particular scene. I need to have my Coke Zero (preferably Vanilla), and my pen, and the right number of sheets of paper. Then I need to have at least an hour of uninterrupted time to accomplish much in the way of writing. Thing is, those ten minute "power bursts" can still help me get the writing done, even if I can't actually write much of anything in ten minutes. I don't know about you, but lots of us who are working as writers have lots of other, non-writing stuff we have to deal with. It's that other stuff that usually leaves me overwhelmed and stressed out. But I can take a ten-minute break when I've been sitting so long at the writing that my knees are whining at me, and go pull a load of laundry out of the dryer. I can take ten minutes and call my dentist for an appointment, or call the parents and make arrangements to come see them. The dentist's visit will take more than ten minutes (alas), but once the appointment's made, it somehow ceases to hang over my head as Something I Have To Take Care Of. I can even group all that stuff together and make myself do it in my less-productive writing time (afternoons, I tend to fall asleep over the writing) in order to free up my more productive hours for the Real Work. I got really good at grouping errands when I lived up in the panhandle, and had to drive 60 miles just to go to Target, or the cleaners. Now that I live in lovely Galveston (we have a Wal-Mart AND a Target! On This side of the Causeway! ), I group visits downtown to the post office and library, and maybe even have lunch on The Strand. I save trips off the island till I have more than one reason to go. And I try my very best to protect my good writing time. When I was talking to a friend about taking a leave of absence from the dayjob to finish my book due last fall, she scoffed and said "Do you really think you'll use that time to write?" I told her, "No, but I can use that time to do all the other stuff that eats away at my writing time." My dayjob was only part time, but I spent an awful lot of my best writing time doing things like getting my hair cut and teeth cleaned. So, even if you know a technique someone recommends won't work for you--see if you can turn it inside out. Maybe it will work another way. Try a 10-minute burst of work--whether writing, or that other stuff. See which way it might work for you. I made chicken-spinach enchiladas tonight. I used a vegetarian recipe and...adapted it. See, I don't live with vegetarians. The men in my life are very much carnivores, so I knew they would not eat anything without meat. And I thought I remembered them both ordering chicken-spinach or shrimp spinach enchiladas at one time or another, so I decided to add chicken. Alteration #1. Change #2: the recipe called for cottage cheese. I do not like cottage cheese. Unlike the guy in opposition to Sam I Am, I HAVE tried cottage cheese, and I do not like it. It's lumpy. I do not like the lumps. So I bought ricotta, since I'm told it's similar in taste, but it isn't lumpy. Also, the recipe was for spinach-broccoli enchiladas. I figured by adding the chicken, I would already have a whole lot of filling to put in my tortillas, so I left out the broccoli. Change #3. I put in more salsa, because it seemed a little dry to me--I'm not sure that was a big enough change to count. I mean, I had all that chicken, so I had a great big bunch of filling, of course it would need more salsa and the recipe did call for it. I just used twice as much (and poured even more over the top. So, instead of vegetarian spinach-broccoli-cottage cheese flour tortilla enchiladas, we had spinach-chicken-ricotta corn tortilla enchiladas. Flavored with salsa and cumin, with grated cheddar to make them even cheesier (all that, plus the sauteed onion, was in the recipe). I wasn't exactly creating a new recipe, just tweaking it to make something my family could and would eat. They were muy delicioso. I suppose the daughter could use tofu instead of ricotta for the dairy sensitive grandboy? Make him his own dish of enchiladas? Oh, and I got THREE pages written today. Go me!